The aim of the workshop was to introduce the methods and models of historicizing of contemporary art and their practical testing on the chosen example of Marij Pregelj. The Coastal Galleries (Obalne galerije) have prepared the retrospective exhibition of Marij Pregelj. A good half of the exhibited paintings comes from the collection of the Belgrade Museum of Contemporary Arts and hence were not seen in Slovenian galleries for a long while. The accent of the exhibition was on the latest large-size dramatic paintings that have a particularly important place in his opus. The opening of the exhibition entitled Marij Pregelj, Paintings 1957-1967, was on March 30 at 19.00 in Coastal Galleries Piran and in Loža Gallery in Koper. The exhibition was accompanied by the monograph introducing texts by Ješa Denegri and Nadja Zgonik as well as the book by Andrej Medved The Iconography of a Certain Painting: Pregelj’s Dyptichon. Moreover, the Modern Gallery prepares for next year a monographic exhibition accompanied by the catalogue. This was an opportunity to tackle in our Seminar on Writing this significant artist who was crucial in establishing modern painting in Yugoslav art, and examine his work in light of different historicizing methods and revised interpretations of his key works. 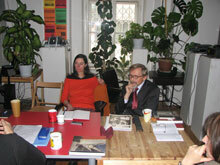 Two experts who both wrote extensively on Marij Pregelj, presented their views: Tomaž Brejc, Professor of Art History and Theory at the Academy of Visual Arts in Ljubljana, and Ješa Denegri, Curator of long standing of the Belgrade Museum of Contemporary Art and Professor of Contemporary Art History at the Faculty of Philosophy in Belgrade. 15.30-19.00: Ješa Denegri and Tomaž Brejc conversing on Marij Pregelj. Born in Kranj. In 1998 he enrolled to the Academy of Visual Arts, Department of Scuplture, where he received his degree in 2004 under the tutorship of Professor Srečo Dragan. 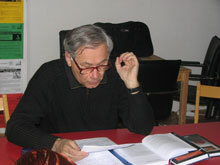 In 2003 and 2004, during his senior year, he was Project Leader at the Student Organisation of the University of Ljubljana in the sector of accompanying activities – department of culture, where he was initiator and head of International Student Sculpture Festival Metamorphosis at the Student Organisation of the University of Ljubljana. He is currently employed as sculptor-puppet designer in Ljubljana Puppet Theatre. He pursues his M.A. 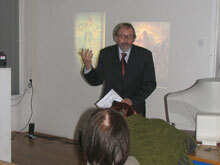 in Philosophy and Theory of Visual Culture at the Faculty of Social Studies in Koper. He writes art critics in the field of contemporary visual arts and publishes interviews with artists. As visual artist, he presents his works on solo exhibitions as well as collective ones under the name Zoran S. Janežič; he also organises exhibitions, festivals and colonies. He lives and works in Ljubljana and Kranj. Born in Ljubljana. She received her degree in Art History at the Faculty of Arts in Ljubljana. In 2002, she enrolled for the Doctoral programme in Historical Anthropology of Fine Arts at Institutum Studiorum Humanitatis – Faculty for Post-graduate Humanistic Studies in Ljubljana. In 2003 and 2004, she attended the Seminar in Writing on Contemporary Art (SCCA-Ljubljana). From 2003 to 2006, she was the Ministry of Culture grantee. She regularly publishes short articles and texts in various publications. Since 2006, she lectures on Art History at Famul Stuart School. She lives and works in Ljubljana. Poetess, translator, writer. Studied Russian and Library Scence. Student of Art History at the Faculty of Arts in Ljubljana.